Proposal reviews: 'Dr Salway's text, Metabolism at a Glance, did find a niche in the market and I believe that he has the expertise to make a success of this new text if it can be tailor-made for the overseas market.' Dr Hywel Thomas, Dean of Basic Medical Sciences, GKT School of Biomedical Sciences, London 'I believe that there is a need for a book that summarises the basic biochemistry that a medical student needs to understand. 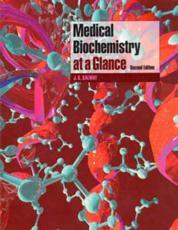 Current texts contain so much detail that many medical students have difficulty in coming to terms with the material...The material proposed provide good coverage of the medically relevant biochemistry that you would expect a medical student to be familiar with.' Dr W. Montague, Leicester Warwick Medical School 'The contents are adequate for any student in an American medical school. I am particularly impressed with the emphasis on clinicaly relevant topics...The author's style and presentation are approachable and usef.